Final morning of our short visit to Malham and Settle up in the Yorkshire Dales. 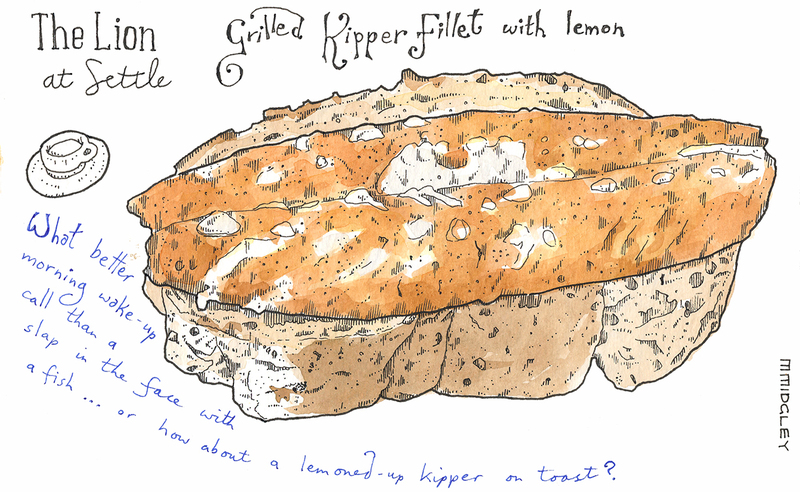 I opt for an invigorating breakfast of grilled kipper. It was served on a huge hunk of granary bread and I managed to snaffle a bit of Caroline’s scrambled egg to add to it. Wow! It’s, like, some time since I last posted. Hey, what can I say? I’ve been busy. But it does mean that I’m way behind on my postings – I may have taken a bit of a hiatus from posting but I’ve been a busy beaver drawing my meals out. Sunnyhills Farm Shop is located in Northumberland. Just off the main road, it has a little gift shop, a large array of local produce and a cafe . We’ve been here before. In fact Sunnyhills was my first meal drawing, way back when. This time I plumped to have some locally sourced kippers; which were delicious, thank you very much. Now, you might be thinking, why bother with kippers – they’ll stink up the place, not to mention leave me with a lingering after taste. Well, I suppose they did hang around a little longer on the palette than some of the menu items would have done. But, oily fish, and freshly cooked oily fish at that, is so mouthwatering. I can forgive it if it wants to hang around for a while. The salad dressing was home made too and complemented the fish well; honey, white wine and vinegar.